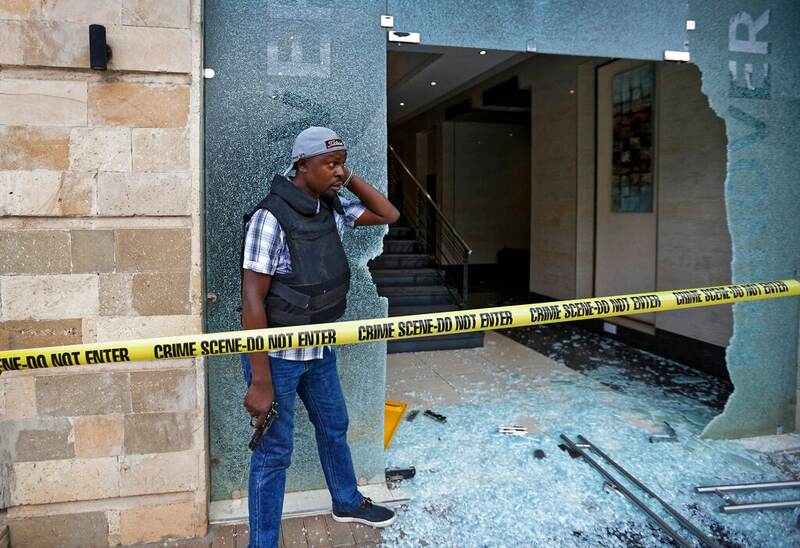 Extremists stormed a luxury hotel in Kenya's capital on Tuesday, setting off thunderous explosions and gunning down people at cafe tables in an attack claimed by Africa's deadliest Islamic militant group. 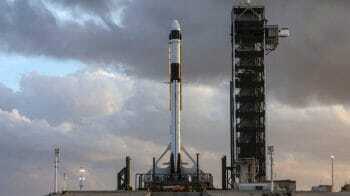 A police officer said at least 15 people had died. Al-Shabab — the Somalia-based group that carried out the 2013 attack at the nearby Westgate Mall in Nairobi that left 67 people dead — claimed responsibility for the carnage at the DusitD2 hotel complex, which includes bars, restaurants, offices and banks and is in a well-to-do neighborhood with many American, European and Indian expatriates. Security forces help a man at the scene of a blast in Nairobi, Kenya Tuesday, Jan. 15, 2019. 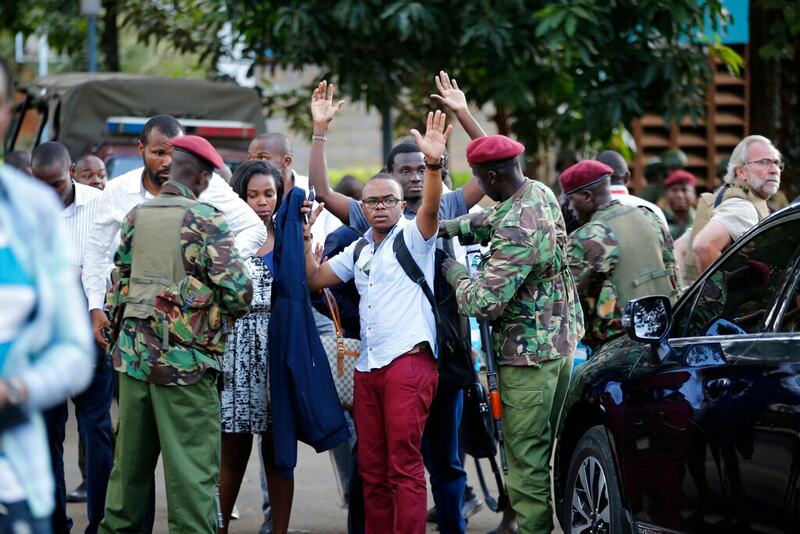 Terrorists attacked an upscale hotel complex in Kenya's capital Tuesday, sending people fleeing in panic as explosions and heavy gunfire reverberated through the neighborhood. 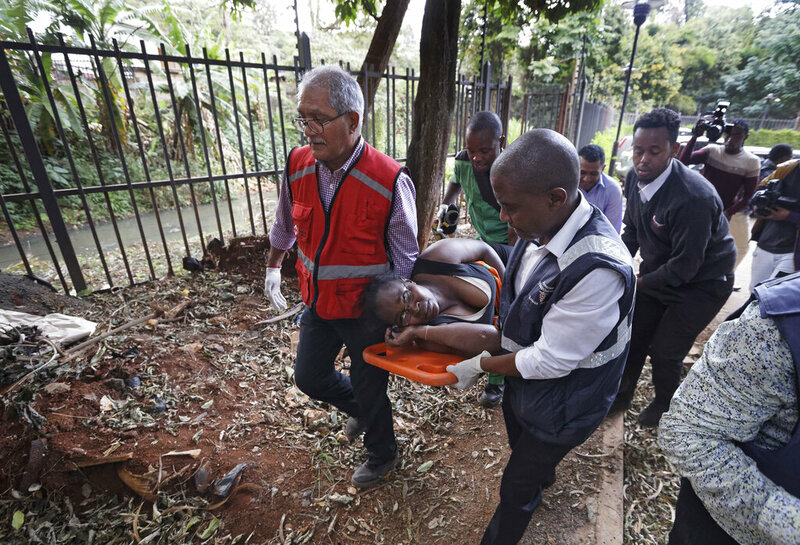 An injured person with gun wounds is brought to the Kenyatta National Hospital in Nairobi, Kenya, Tuesday, Jan. 15, 2019. 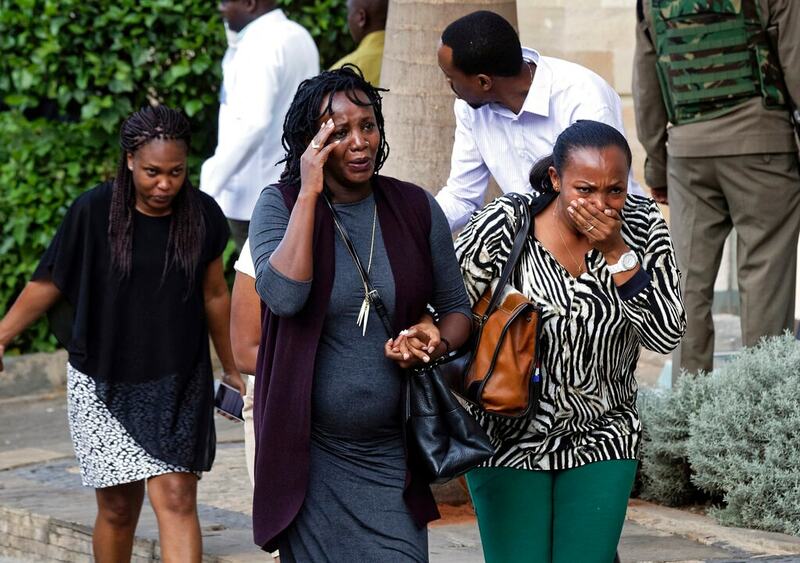 Terrorists attacked an upscale hotel complex in Kenya's capital Tuesday, sending people fleeing in panic as explosions and heavy gunfire reverberated through the neighborhood. 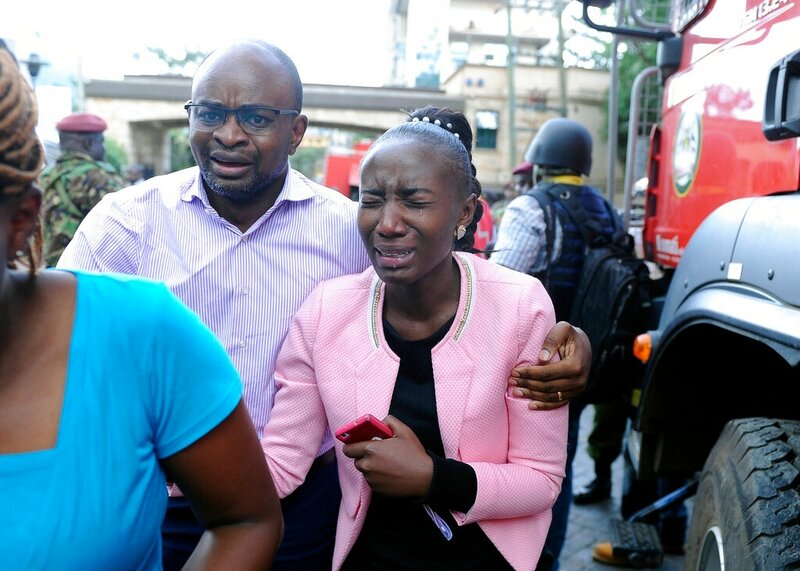 A woman cries as she is rescued from the scene at a hotel complex in Nairobi, Kenya Tuesday, Jan. 15, 2019. 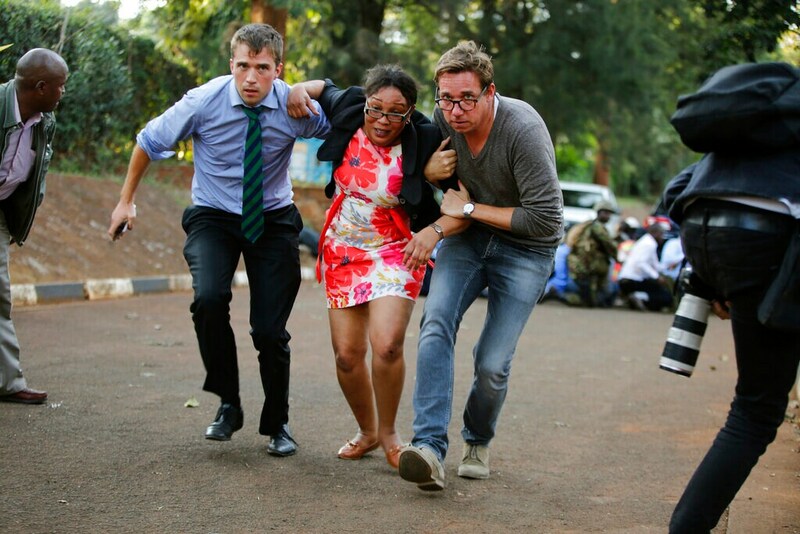 Terrorists attacked an upscale hotel complex in Kenya's capital Tuesday, sending people fleeing in panic as explosions and heavy gunfire reverberated through the neighborhood. 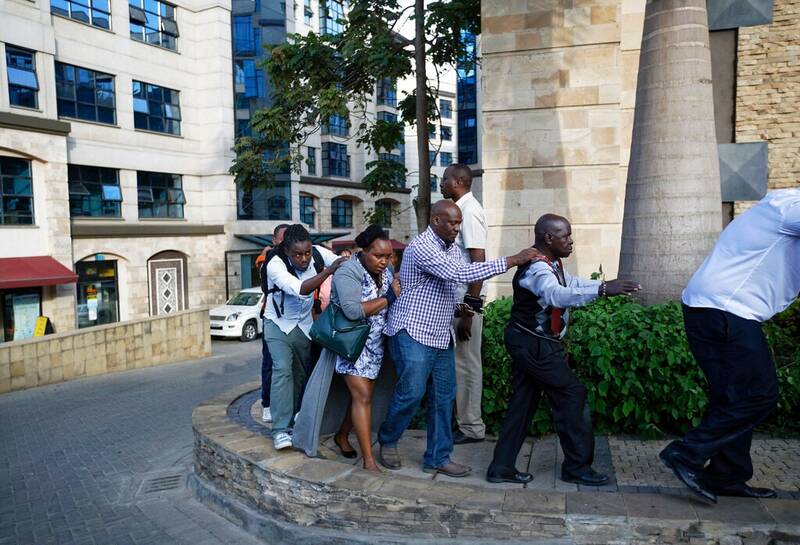 Civilians helped by plain-clothes security forces flee the scene at a hotel complex in Nairobi, Kenya Tuesday, Jan. 15, 2019. 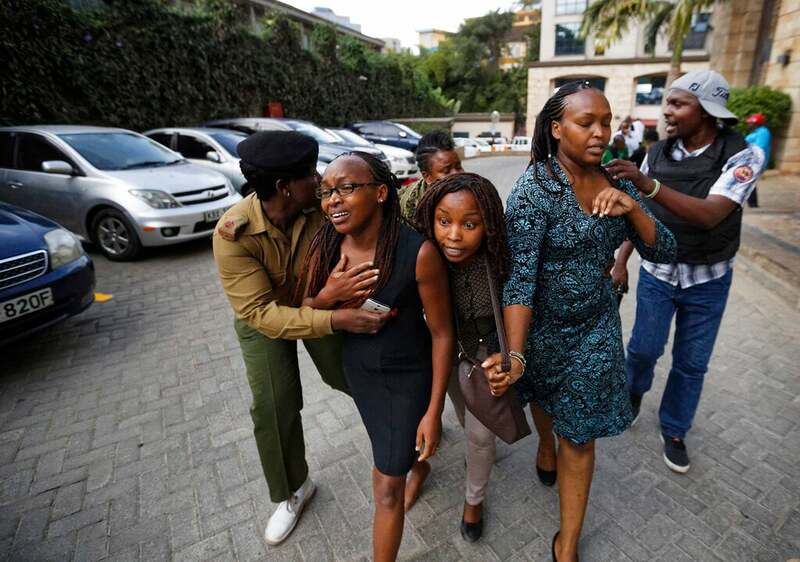 Terrorists attacked an upscale hotel complex in Kenya's capital Tuesday, sending people fleeing in panic as explosions and heavy gunfire reverberated through the neighborhood. 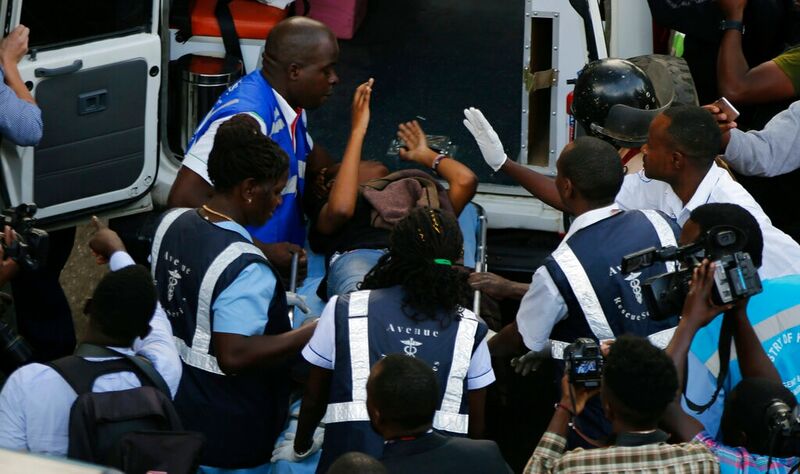 An injured woman is carried away by paramedics at a hotel complex in Nairobi, Kenya Tuesday, Jan. 15, 2019. 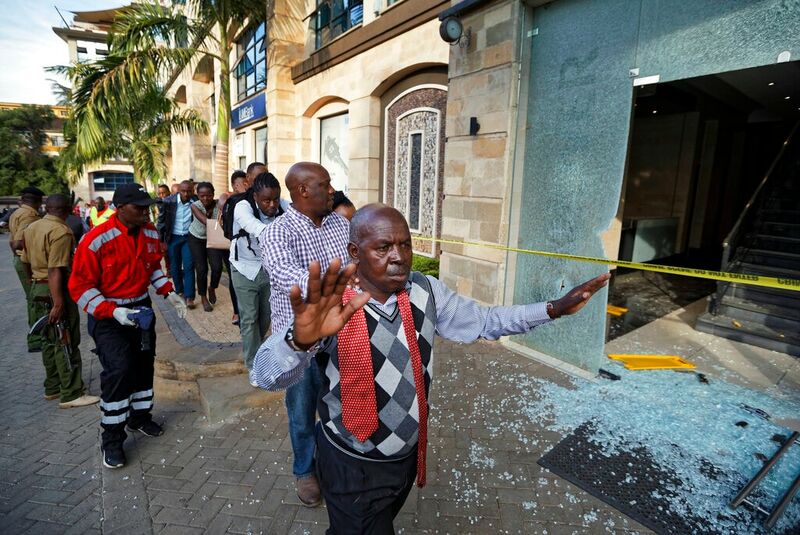 Terrorists attacked an upscale hotel complex in Kenya's capital Tuesday, sending people fleeing in panic as explosions and heavy gunfire reverberated through the neighborhood. 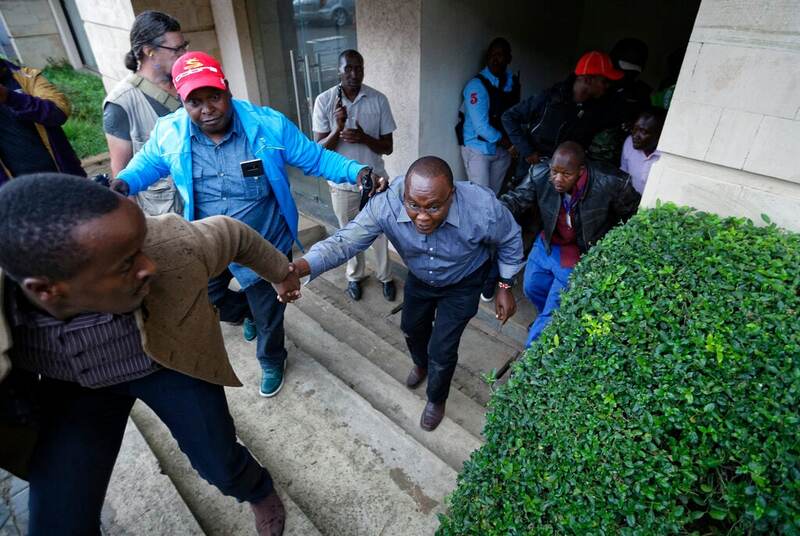 Civilians who had been hiding in buildings flee under the direction of a member of security forces at a hotel complex in Nairobi, Kenya Tuesday, Jan. 15, 2019. 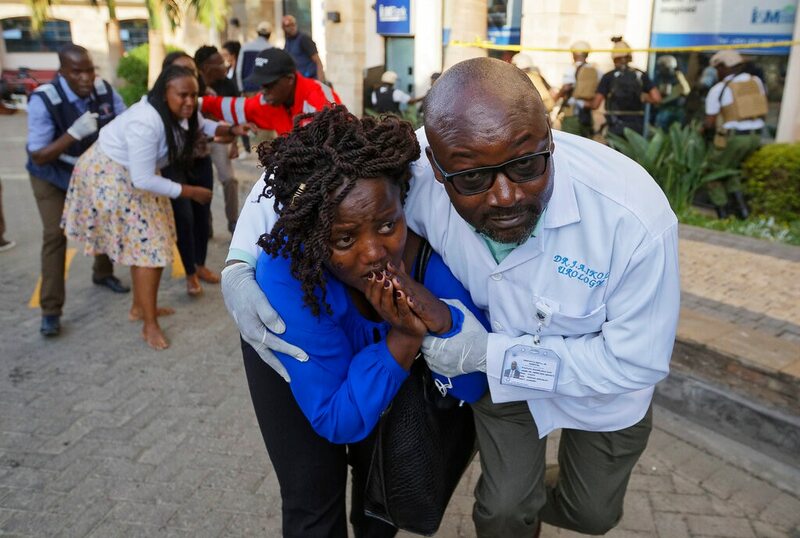 Terrorists attacked an upscale hotel complex in Kenya's capital Tuesday, sending people fleeing in panic as explosions and heavy gunfire reverberated through the neighborhood. 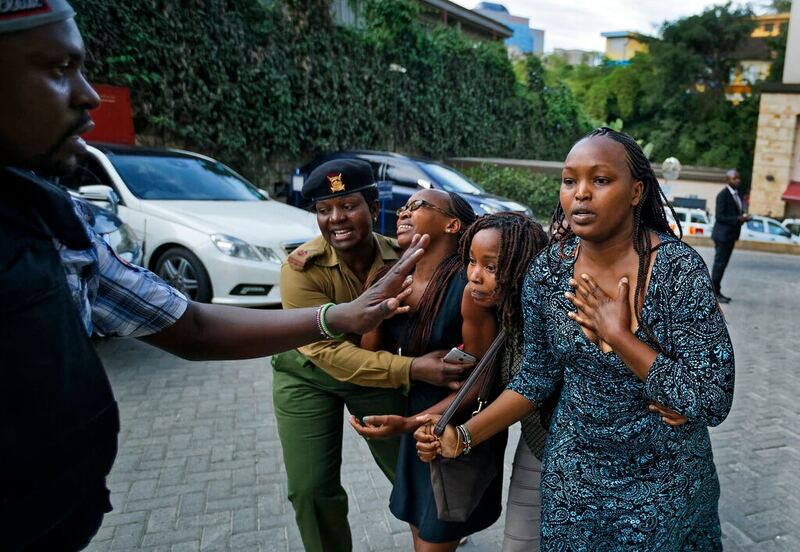 Civilians who had been hiding in buildings flee under the direction of security forces at a hotel complex in Nairobi, Kenya Tuesday, Jan. 15, 2019. 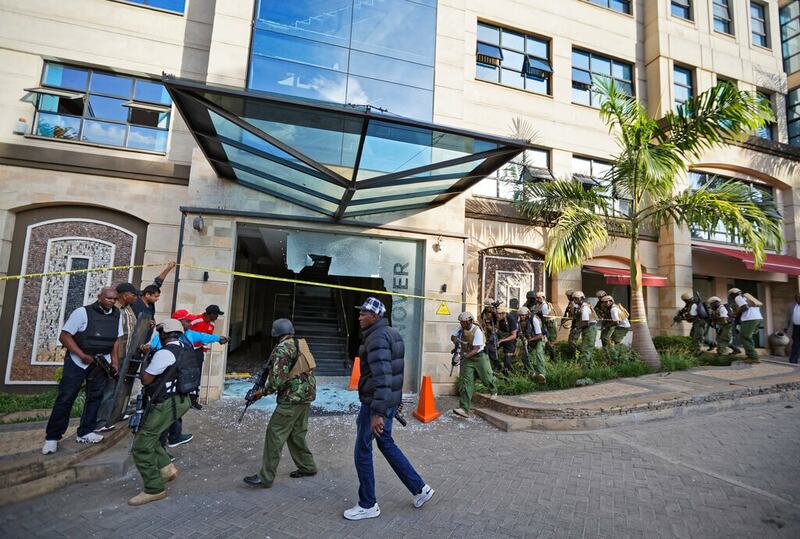 Terrorists attacked an upscale hotel complex in Kenya's capital Tuesday, sending people fleeing in panic as explosions and heavy gunfire reverberated through the neighborhood. 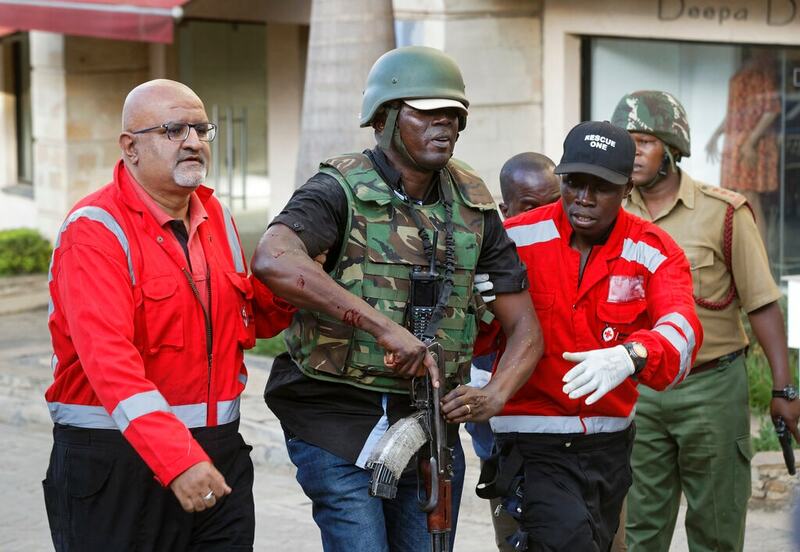 Kenyan armed forces rescue people after an attack on a hotel, in Nairobi, Kenya, Tuesday, Jan. 15, 2019. 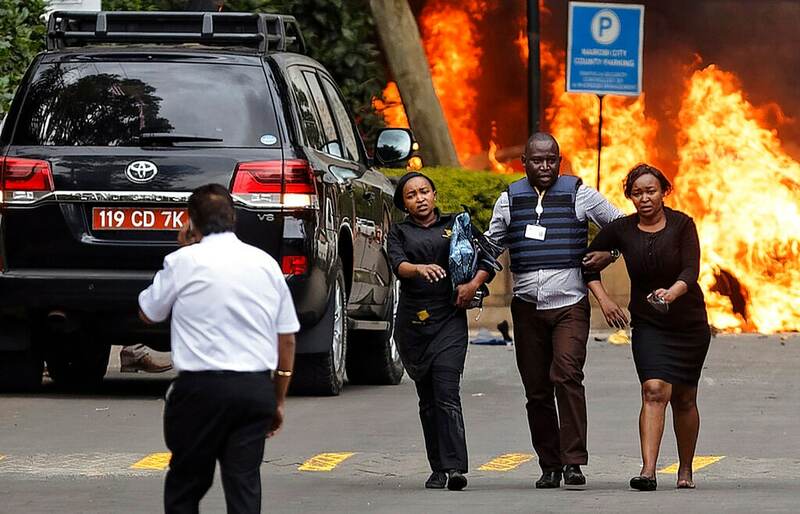 Extremists launched a deadly attack on a luxury hotel in Kenya's capital Tuesday, sending people fleeing in panic as explosions and heavy gunfire reverberated through the complex. A police officer said he saw bodies, "but there was no time to count the dead." 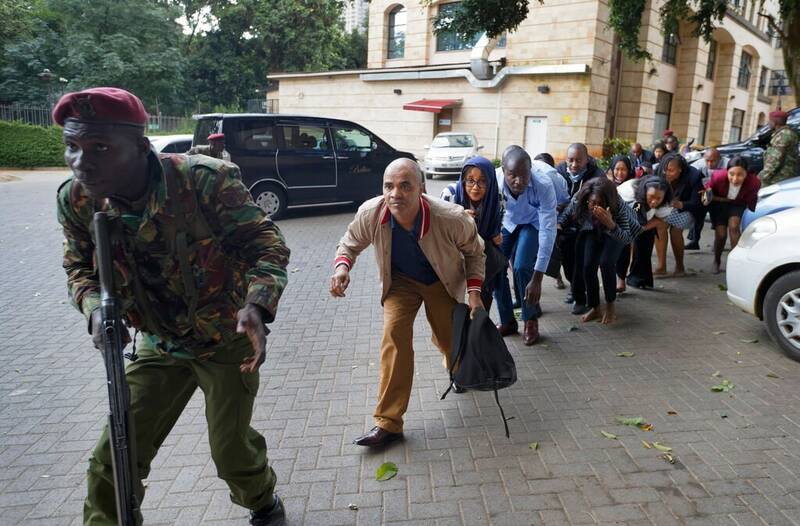 Civilians flee helped by a member of the security forces at a hotel complex in Nairobi, Kenya, Tuesday, Jan. 15, 2019. 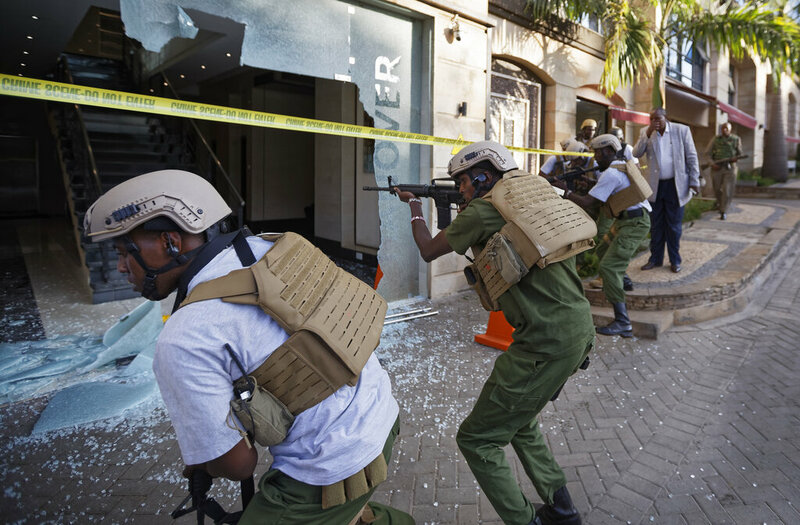 Terrorists attacked an upscale hotel complex in Kenya's capital Tuesday, sending people fleeing in panic as explosions and heavy gunfire reverberated through the neighborhood. 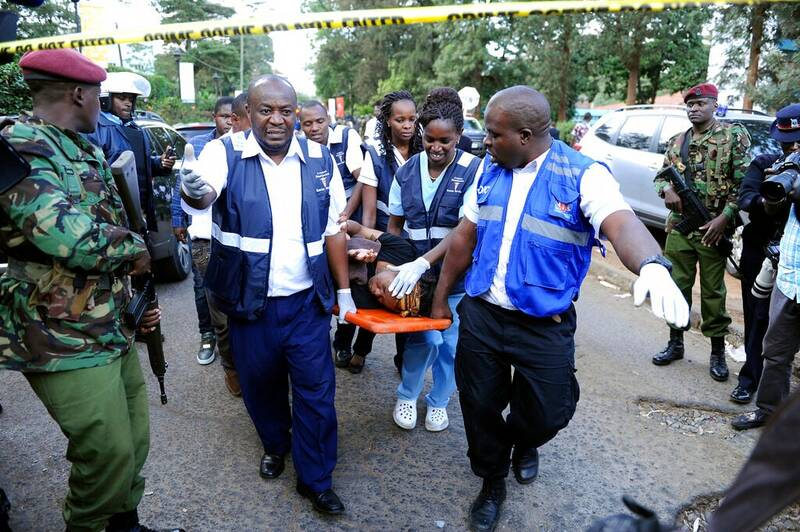 A civilian is helped by paramedics at a hotel complex in Nairobi, Kenya Tuesday, Jan. 15, 2019. 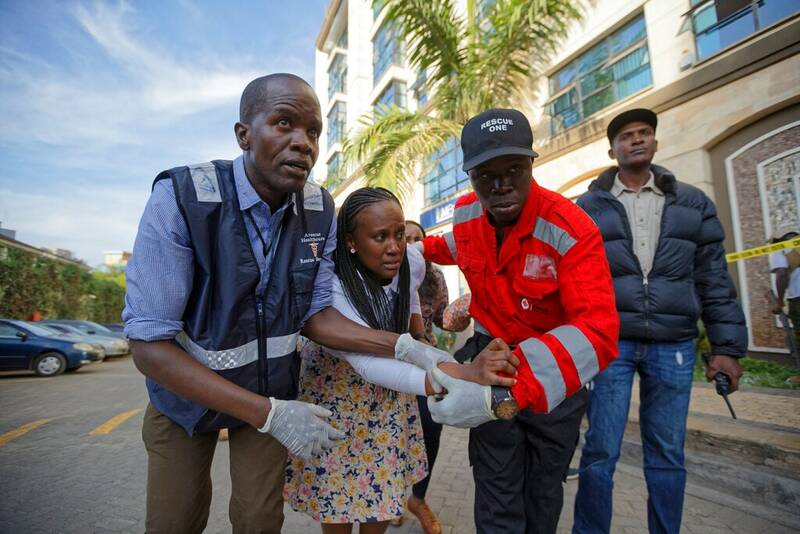 Terrorists attacked an upscale hotel complex in Kenya's capital Tuesday, sending people fleeing in panic as explosions and heavy gunfire reverberated through the neighborhood. Security forces surround a hallway behind a shattered door in which an unexploded grenade lies, at a hotel complex in Nairobi, Kenya Tuesday, Jan. 15, 2019. 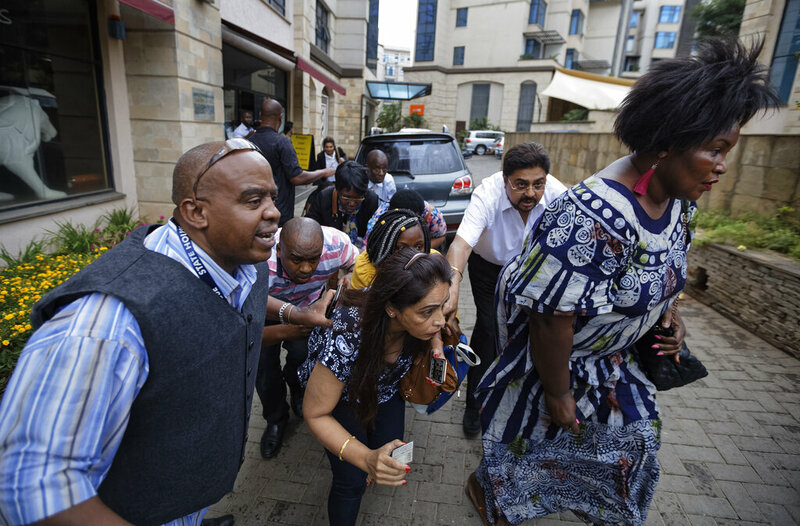 Terrorists attacked an upscale hotel complex in Kenya's capital Tuesday, sending people fleeing in panic as explosions and heavy gunfire reverberated through the neighborhood. An injured member of the security forces is helped by paramedics at a hotel complex in Nairobi, Kenya Tuesday, Jan. 15, 2019. 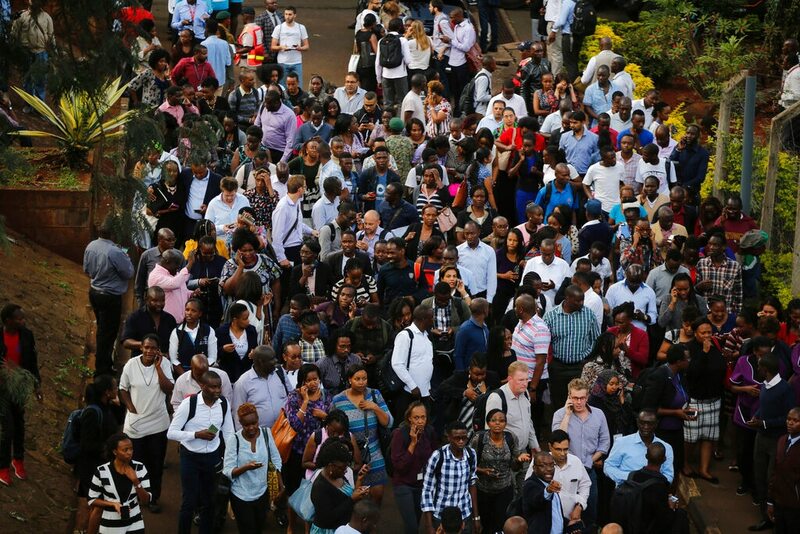 Terrorists attacked an upscale hotel complex in Kenya's capital Tuesday, sending people fleeing in panic as explosions and heavy gunfire reverberated through the neighborhood. 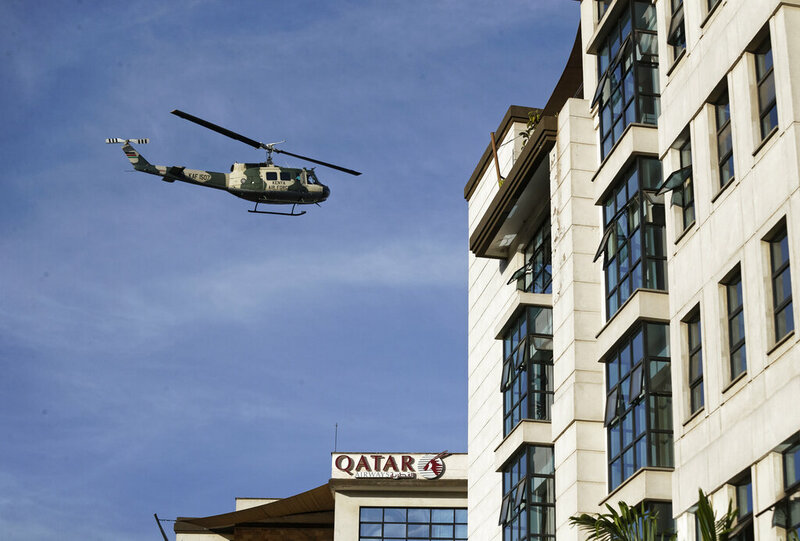 A Kenya Air Force helicopter flies over a hotel complex in Nairobi, Kenya Tuesday, Jan. 15, 2019. 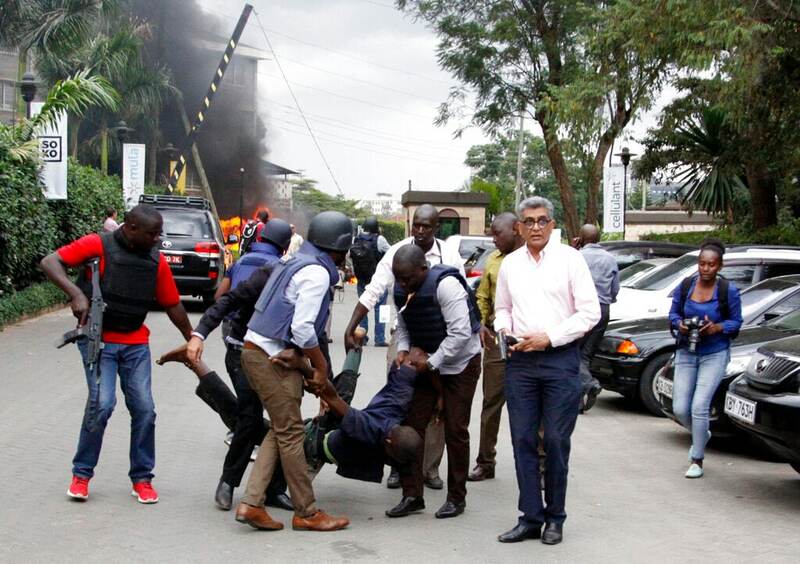 Terrorists attacked an upscale hotel complex in Kenya's capital Tuesday, sending people fleeing in panic as explosions and heavy gunfire reverberated through the neighborhood. 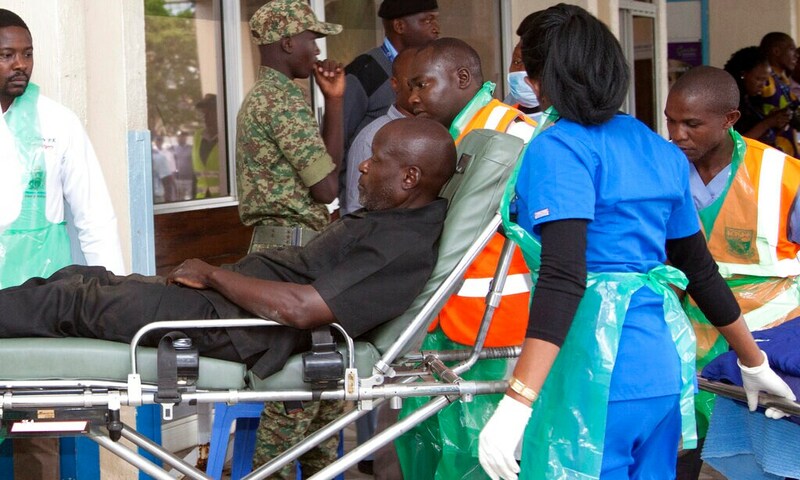 Kenya medics put an injured person in ambulance after a blast in Nairobi, Kenya, Tuesday, Jan. 15, 2019. 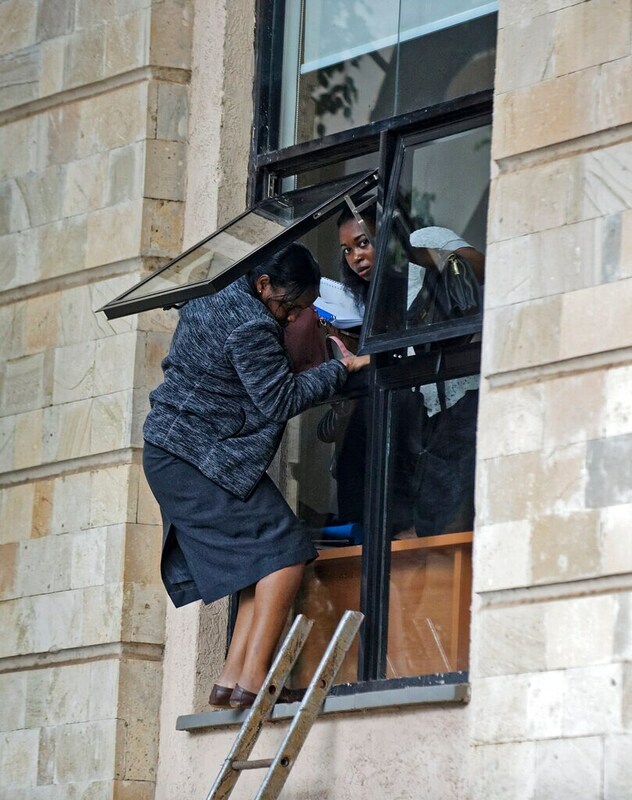 Extremists launched a deadly attack on a luxury hotel in Kenya's capital Tuesday, sending people fleeing in panic as explosions and heavy gunfire reverberated through the complex. A police officer said he saw bodies, "but there was no time to count the dead." A civilian flees the scene assisted by a member of security forces, at a hotel complex in Nairobi, Kenya Tuesday, Jan. 15, 2019. 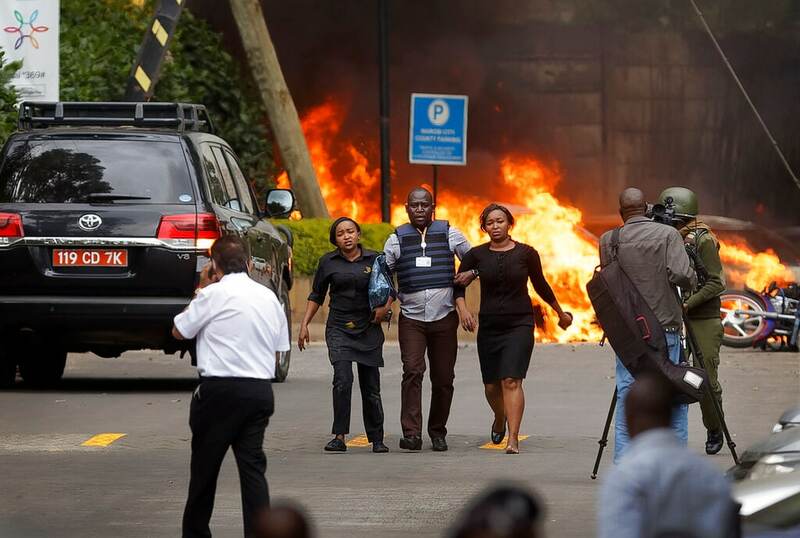 Terrorists attacked an upscale hotel complex in Kenya's capital Tuesday, sending people fleeing in panic as explosions and heavy gunfire reverberated through the neighborhood. 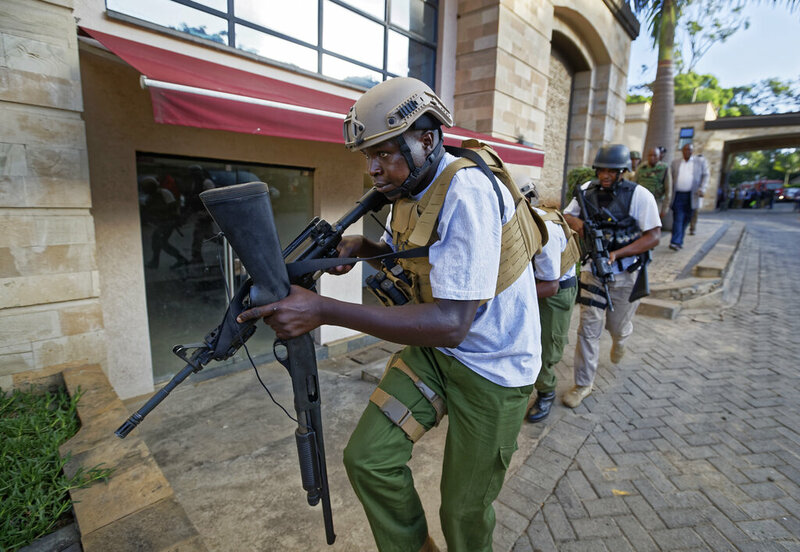 An armed member of Kenyan security forces runs through a hotel complex in Nairobi, Kenya Tuesday, Jan. 15, 2019. 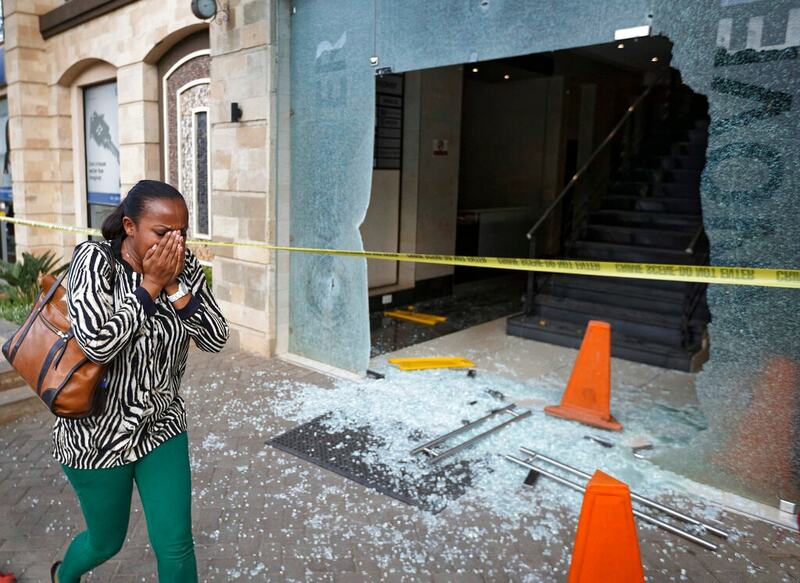 Terrorists attacked an upscale hotel complex in Kenya's capital Tuesday, sending people fleeing in panic as explosions and heavy gunfire reverberated through the neighborhood. 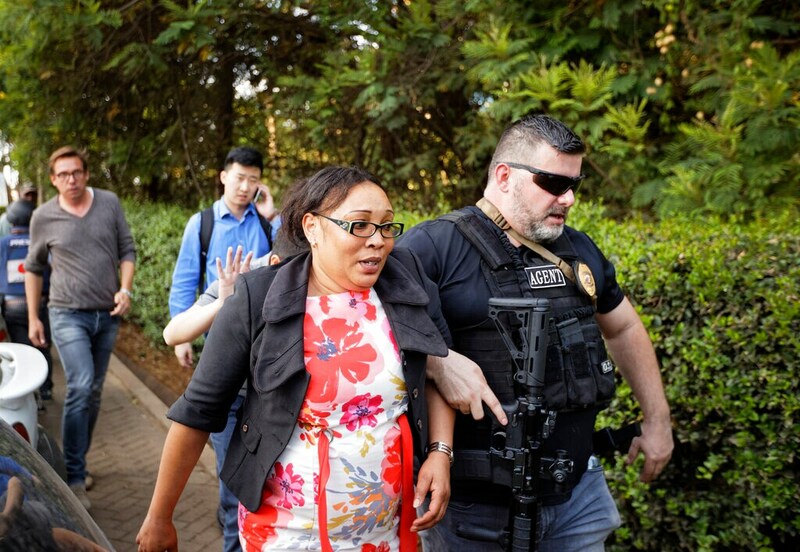 An unidentified member of the foreign security forces helps a civilian to flee a hotel complex in Nairobi, Kenya Tuesday, Jan. 15, 2019. 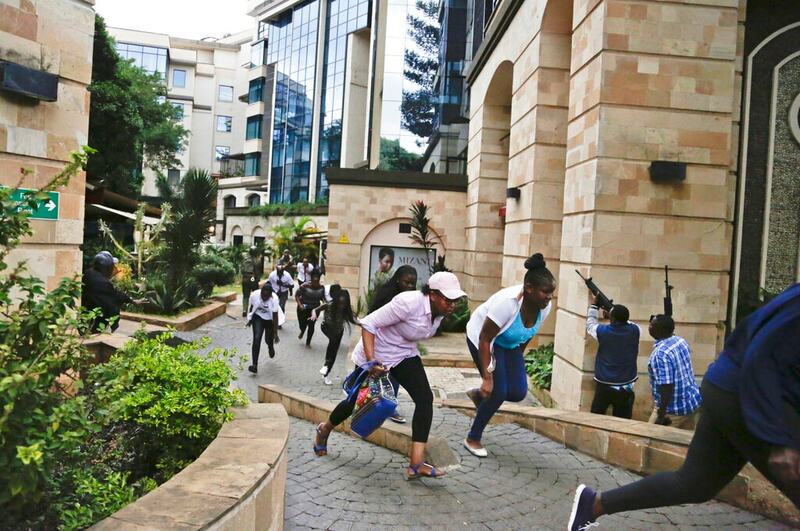 Terrorists attacked an upscale hotel complex in Kenya's capital Tuesday, sending people fleeing in panic as explosions and heavy gunfire reverberated through the neighborhood. 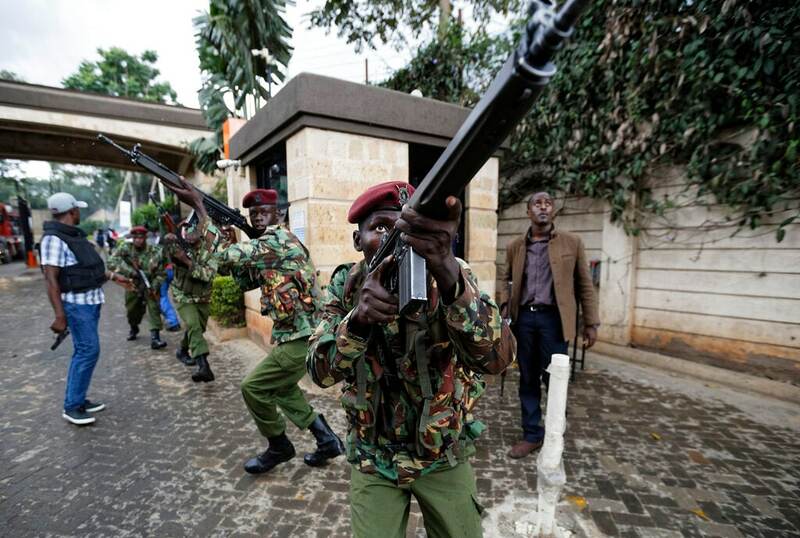 Civilians flee as security forces aim their weapons at a hotel complex in Nairobi, Kenya Tuesday, Jan. 15, 2019. 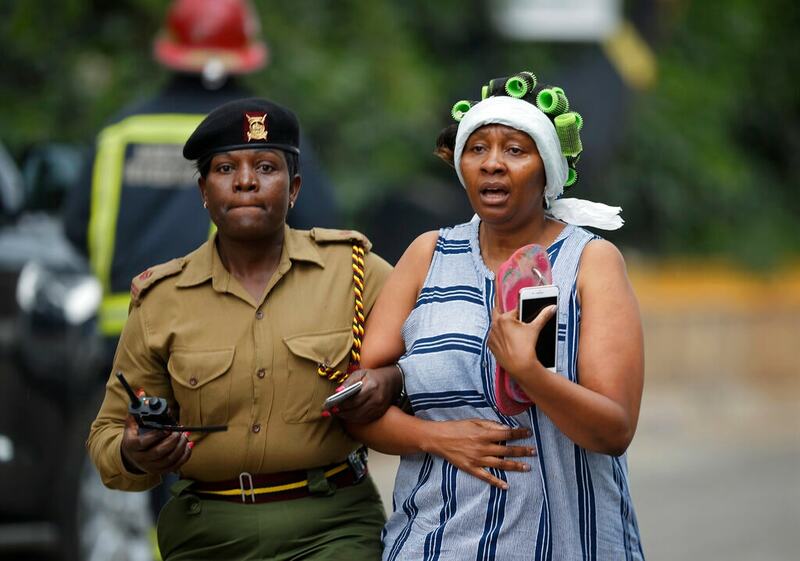 Extremists launched a deadly attack on a luxury hotel in Kenya's capital Tuesday, sending people fleeing in panic as explosions and heavy gunfire reverberated through the complex. A police officer said he saw bodies, "but there was no time to count the dead." 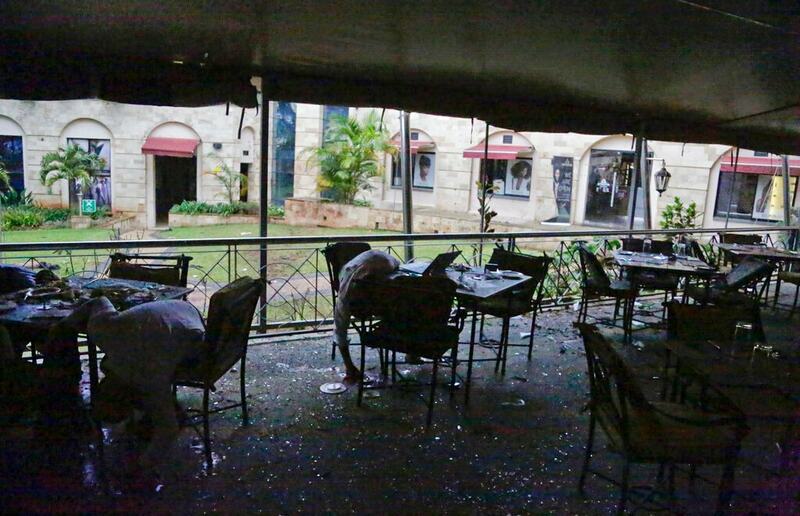 Bodies are seen in a restaurant at the site of an attack on a hotel complex in Nairobi, Kenya, Tuesday, Jan. 15, 2019. Extremists have launched an attack on a luxury hotel in Kenya's capital, sending people fleeing in panic as explosions and heavy gunfire reverberate through the neighborhood. A police officer says he saw bodies, "but there was no time to count the dead." Al-Shabab _ the Somalia-based extremist group _ is claiming responsibility. 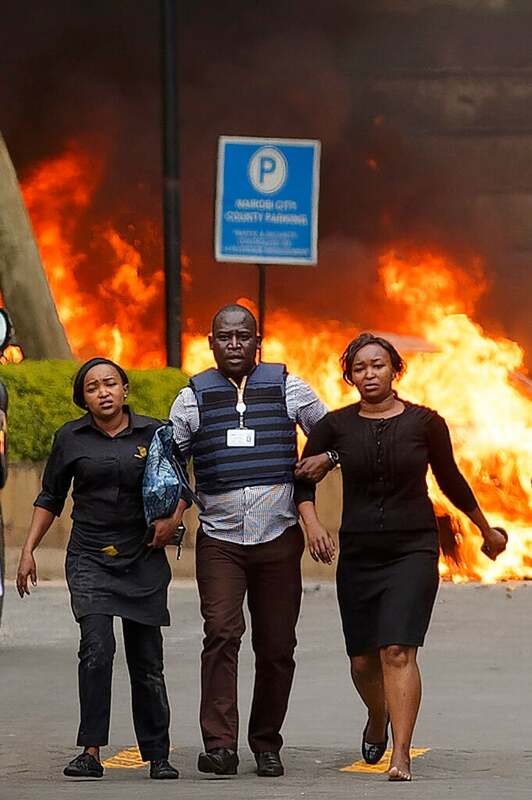 Security forces help civilians flee the scene as cars burn behind, at a hotel complex in Nairobi, Kenya Tuesday, Jan. 15, 2019. Extremists have launched an attack on a luxury hotel in Kenya's capital, sending people fleeing in panic as explosions and heavy gunfire reverberate through the neighborhood. A police officer says he saw bodies, "but there was no time to count the dead." 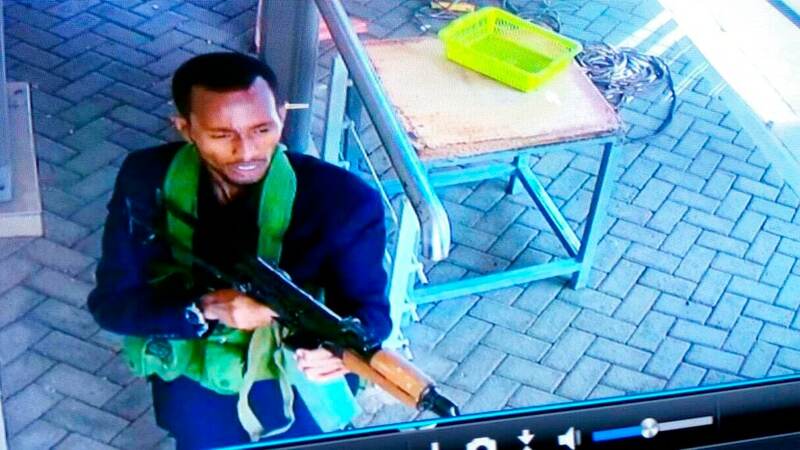 Al-Shabab _ the Somalia-based extremist group _ is claiming responsibility. 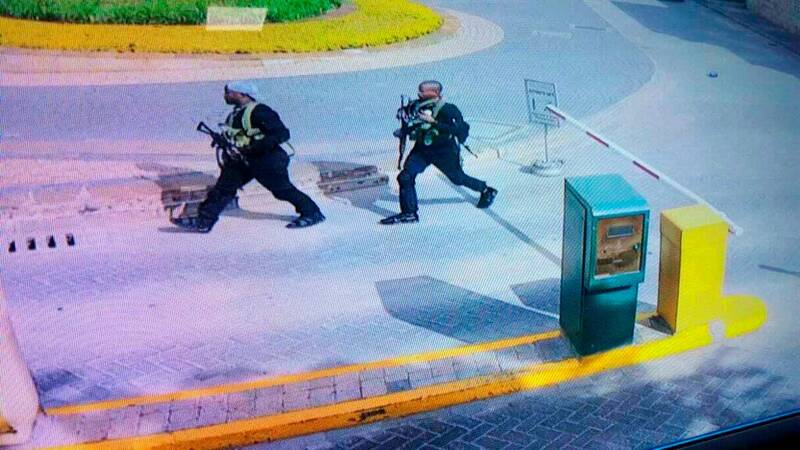 In this grab taken from security camera footage released to the local media, heavily armed attackers walk in the compound of a hotel, in Nairobi, Kenya, Tuesday, Jan. 15, 2019. Extremists launched an attack on a luxury hotel in Kenya's capital, sending people fleeing in panic as explosions and heavy gunfire reverberate through the neighborhood. A police officer says he saw bodies, "but there was no time to count the dead." Al-Shabab _ the Somalia-based extremist group _ is claiming responsibility. 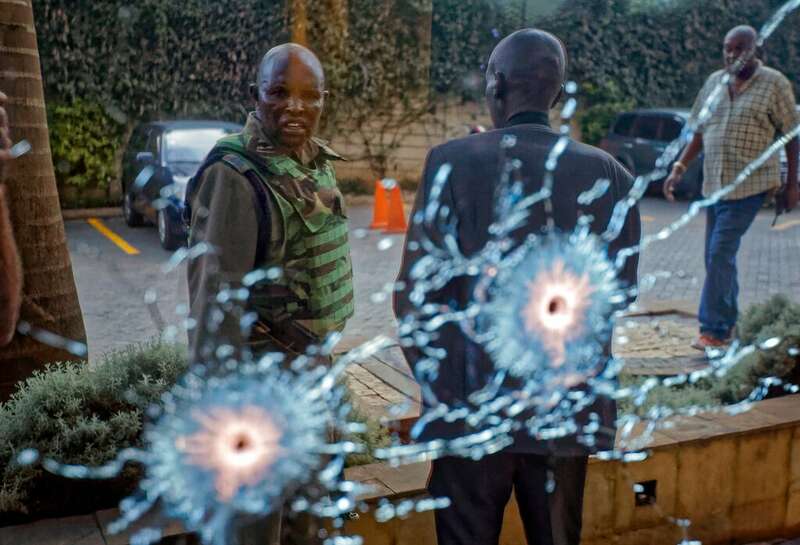 In this grab taken from security camera footage released to the local media, an armed attacker walks in the compound of a hotel, in Nairobi, Kenya, Tuesday, Jan. 15, 2019. Extremists launched an attack on a luxury hotel in Kenya's capital, sending people fleeing in panic as explosions and heavy gunfire reverberate through the neighborhood. A police officer says he saw bodies, "but there was no time to count the dead." Al-Shabab _ the Somalia-based extremist group _ is claiming responsibility.